I have been in love with the mysterious Italian liquor known as Fernet for over ten years. The dark syrupy substance ranks as my favorite post dinner drink with grappa and sambuca rounding out the trifecta. It was not love at first shot by any means. I first tasted Fernet in Italy during my days as a student at the American University of Rome. I remember the harsh medicinal taste of the first sip but then gradually warmed up to it. I became such a fan, that one night we finished a bottle of it at an apartment near the Flaminio and I realized Fernet was something special! As romances sometimes go we lost touch and I moved on to other amari. Then one day we reconnected. While ordering a Negroni at my local bar I saw the familiar dark green bottle sitting uncomfortably between Averna and Campari. As the bartender reached for the red amaro, I decided to make my move and asked him to substitute Fernet. I realized that I was bored of the same old cocktail recipes. Don't get me wrong, I love Manhattans, Negronis, and Pimms Cups and other timeless classics but sometimes I need an extra kick. So I began to"Italianize" my cocktails with Fernet Branca. First a little background: Fernet is an herbal liquor or “digestivo” has been popular in Italy and France since the 19th century. The Fratelli Branca's Fernet-Branca brand is the most popular in the world but there is also an excellent variety produced by the Venetian produced Fernet Luxardo. The soothing liquor is made from 27 herbs, including saffron, aloes, gentian, rhubarb, gun myrrh, red cinchona bark, & other exotic spices and has a medicinal quality which can be refreshing after a satisfying meal. Be warned that it is 80 proof and a cousin to Jaegermeister so it is not your typical amaro. The modern Fernet invasion into the United States began in San Francisco in the late 90s and has continued to spread east. 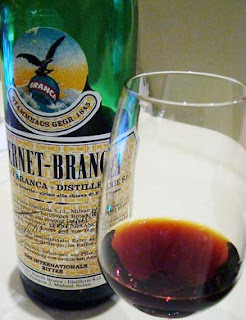 According to Nate Cavalieri’s article on the Fernet-Branca obsession in San Francisco, “The Myth of Fernet,” from the December 7, 2005 issue of SF Weekly, the city consumes more of the liquor than any other place in the United States. Fernet has become an institution with bar patrons from the Italian enclave of North Beach to the hipster Mission district to South of Market (SoMA) street back up to Haight Street and beyond. In his article, Cavalieri also goes into the history of Fernet Branca in America as an elixir. It has the notoriety of being the only alcoholic substance imported into the United States during prohibition, the government considered it medicine. As you can imagine, it flew off the shelves at local pharmacies! All this history adds to the mythical and outlaw nature of the liquor. In the past five years, Fernet has been making inroads on the East Coast gaining popularity in Boston and amongst bar and restaurant industry folks in New York as well. According to drinkboston.com, the trend of drinking Fernet Branca by chefs, bartenders, and waitstaff alike can be compared to a reaction against the fashionista commercialism of Cosmopolitan and expensive vodka bottle service mania. In other words, Fernet is an outlaw drink and that only true cognoscenti can handle! Pour the Fernet Branca into a cordial glass, add a twist of lemon when in Sicily or drinking with the Senator. Pour the Fernet over ice into a rocks or high ball glass, serve with lemon twist. Pour the Fernet into an ice filled shaker and "wash the ice" by stirring the liquid, then drain it. Combine the Rye (we prefer the American brand Michter's Rye over the Canadian variety), and the vermouth into the shaker. Stir rigorously and serve up in a martini or coupe glass. Garnish with a twist of lemon or burnt orange. Combine the ingredients over ice in a shaker. I prefer a dry gins like Plymouth or Bombay in this cocktail. Try not to use botanical infused gins, like Bombay Sapphire or Hendricks, as they will not blend well with the strong medicinal qualities of the Fernet. Stir until chilled and serve up in a cocktail glass. Garnish with orange twist. Pour the Fernet over ice in a highball glass. Then pour in Coca-Cola (practically a national drink in Argentina) or ginger ale (a favorite in San Francisco). The Pimms Italiano is a Milanese take on the traditional English Pimms Cup. Combine a slice of cucumber, lemon, and mint into a rocks glass. Muddle the ingredients using a bar spoon or muddler. Add ice. Pour in Pimms No. 1, then ginger ale and stir. Finally add the, Fernet Branca as a floater. Garnish with a Cucumber slice and drink away. What Ever Happend to Vegas? Brooklyn Social - "Non-Members Welcome"